As you walk through the gate of the eight foot tall wooden fence separating Olsen’s from a busy Palermo street, you step into a patio garden complete with pine trees, a metal sculpture and a fountain on an adjacent wall that’s covered with vines. Soft music surrounds the dining tables on the patio, and comfortable outdoor cocktail tables are scattered on wooden decks in the thick grass. 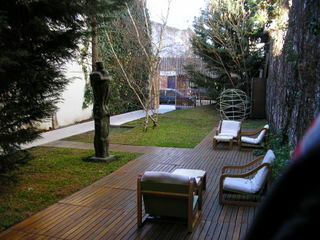 The garden is a tranquil space and comfortable for lunch even on a July and August winter afternoon. The set lunch menu at AR$32 (US$8.50) is an incredible bargain, and our lunch was equal in quality to our dinner. Inside what was once a commercial space, with a soaring ceiling and a mezzanine with a few tables overlooking the main dining area, the interior, complete with a central round metal fireplace, is a classic minimalist Scandinavian room of blonde wood, straight lines, and bright colors. Home made soft bagels with flavored cheeses and butters start the meal. 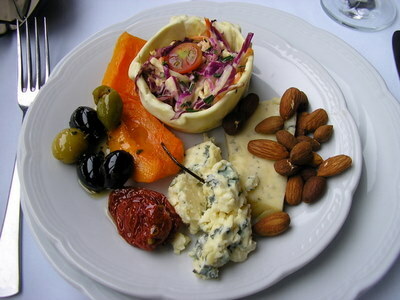 Appetizers feature traditional Scandinavian smoked salmon, smoked herring and caviars. Our generously sized herring fillet, which we shared, came smothered in a mustard sauce with slices of rustic pumpernickel bread and red onions. Fish dominates the entrees, and my wife had an excellent grilled tuna steak on a creamy potato puree w/stewed cherries and pickled cucumber. 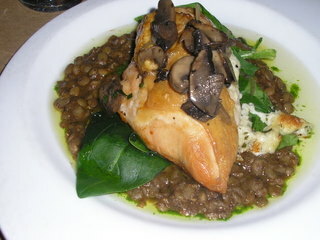 My grilled chicken breast stuffed with goat cheese and topped with wild mushrooms on a bed of barbecued lentils was flavorful but the chicken had been on the grill too long and was on the dry side. Dessert was an excellent and adventurous warm, piquant red pepper tart topped with a white chocolate and red pepper ice cream. The bar is popular and there is an enormous vodka selection. Many people order the flight of vodkas which come appropriately chilled. My only complaint is the volume of the sound system, which is at high decibel levels in the evening. Personally, I like to talk, not shout, with dinner companions. 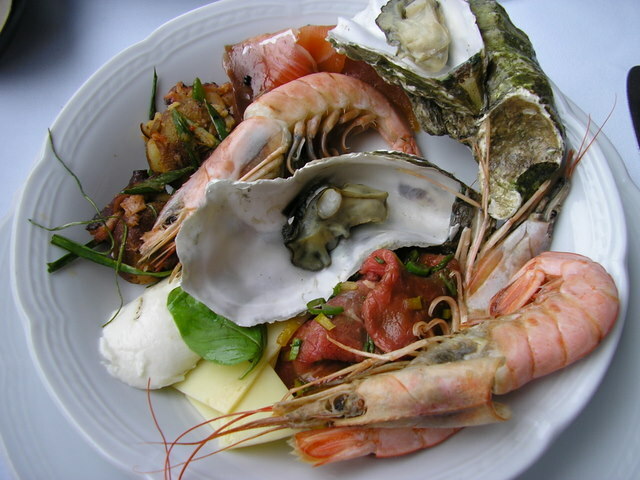 Dinner with wine for two came to AR$224 (US$60.00). Reservations are essential for dinner, phone: 54 11 4776 7677. It is an unfortunate reality that in a nation with a thriving agricultural export economy, a large percentage of Argentina's best products leave the country. This is especially true for nation's prized beef. Premium prices are paid for the four-legged residents of the Pampas by a world eager for succulent, grass-fed, organically raised cattle. For the finest cuts of Argentine beef many gourmands will be better satisfied by dining in Michelin starred restaurants in the world’s capitals than in Buenos Aires. Even with this reality, the average Argentine parrilla (steak house) serves grass-fed beef, lamb and pork that excels in flavor, is naturally lean if not always fork tender. Yet, of course, there are exceptions because there is always an internal market for the very best. 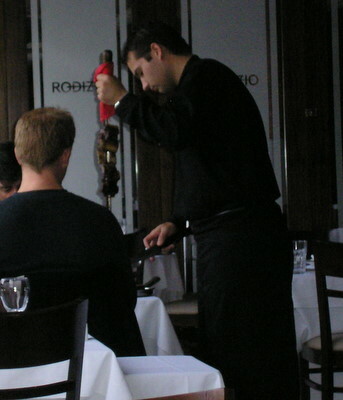 Restaurant Rodizio, in the trendy Puerto Madero district, is one of these notable exceptions, and not just for their meat. From the outside, Rodizio looks like all the other restaurants in this upscale barrio and, if it had not been recommended by a Porteno (a Buenos Aires native), I would have judged it as similar to many other trendy venues. Situated in an old restored brick warehouse, close to the bustling financial district, the smartly designed interior of Rodizio has a panoramic view of the old commercial canal and the fashionable high rise condos of Puerto Madero. Even the menu by the front door did not fully explain the culinary delight I was destined to experience. After being greeted by the friendly staff, my eyes fell upon an unexpectedly sumptuous, multi leveled and artfully designed buffet brimming with fresh sushi, sashimi, calamari salad, shrimp mousse, smoked salmon, whole steamed shrimp, steamed oysters on the half shell (very wise), Carpaccio (marinated raw beef), potatoes in a variety of salads as well as seasoned and sautéed, blue cheese, herb cheese, goat cheeses, edam cheese, roasted almonds, walnuts, red cabbage slaw in cracker cups, marinated squash, olives, marinated sun died tomato, roasted peppers and zucchini, stuffed cold chicken and veal rolls, a variety of cold sliced hams and every type of salad ingredient anyone could ever desire. And that was not all, it’s just what I ate. Between trips to the buffet to create sample plates, the remainder of the meal was a succession of seven different grilled meats each brought on large skewers impaled on cutting boards. Chinchulines (grilled small intestine), grilled sausages - chorizo and morsilla (known in English as blood sausage) - beef, lamb, pork and sweet breads - all accompanied by the wonderful Argentine multi spice and herb chimicura sauce. All the cuts were prime, grilled medium over fresh wood charcoal, full of flavor and very tender. Needless to say, dinner lasted hours, I was full and exceptionally happy. 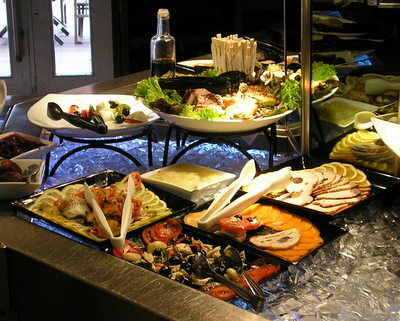 This set-menu feast (no a la carte option) cost AR$115 (US$31.00) per person. For weekday lunch the cost is reduced to AR$85 (US$27.00). The respectable wine list was in the acceptable range for a first class restaurant - AR$25 and up (US$7.00 and up). 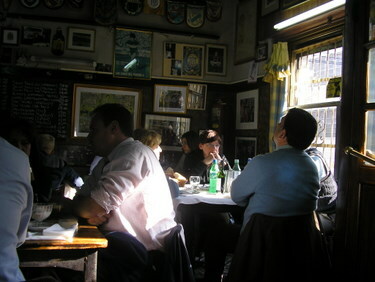 In the industrial/warehouse area of La Boca - the original port of the city - one of the finest restaurants in Buenos Aires, El Obrero, has been jammed with business people and students for the past half century. You'll enjoy terrific calamari, steaks, pastas and fine wines at sturdy wooden tables. Few tourists find El Obrero even though better guide books list it as a "must." Unfortunately, these same books will "caution" tourist about the problem of getting taxis because of the "area." In my experience, taxis don't make it part of their regular run because the business professionals drive their own BMWs and Citroens and park on the street! El Obrero is difficult to find so taking a taxi is recommended, just make sure you have the address written down to hand to the driver. 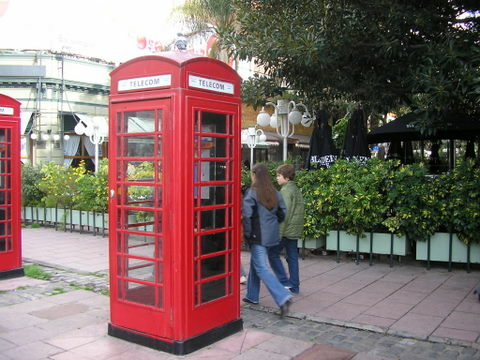 Even though it’s located in La Boca, it is not near the tourist area of the docks. 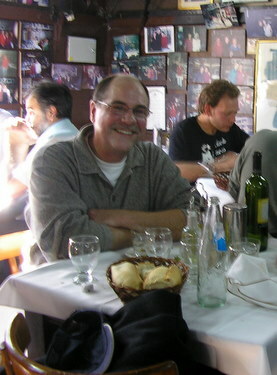 Your waiter will call a taxi when you are finished your meal, a common service in most Argentine restaurants. During my first lunch, while observing most of the staff embracing guests who were obvious regulars, I noticed a mature woman bussing tables, including my own. 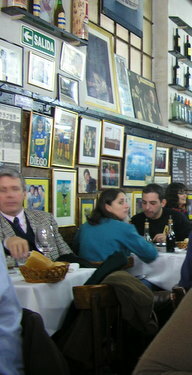 Towards the end of lunch, while pursuing the many photos of Argentine and international celebrities hanging on the wall, I saw one that conspicuously looked like my bus person - much younger and wearing a chic dress. Sure enough, she was both a bus person and a partner, with her brother-in-law, of El Obrero. That's hands-on management and customer service in action! An unassuming little place on the corner of Calle Olleros and Fraga in the up and coming western barrio of Colegiales, Restaurant Masmadre is one of the few mainstream tour book recommendations that was right on the mark! It's a small simple space with a dozen tables, a minimum of art and vintage kitchen items decorating the walls. 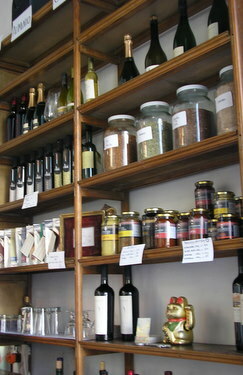 The focal point is on the old grocery market counter selling whole grain breads, jams and jarred vegetables - all from small purveyors in the area. 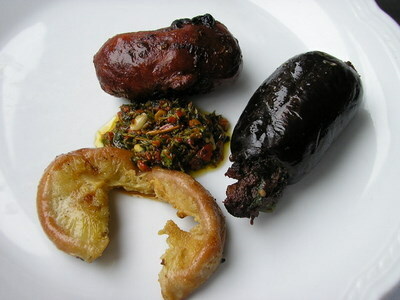 The menu is a 50/50 mix of meat and vegetarian dishes - rare in this meat loving country - that exude careful planning. 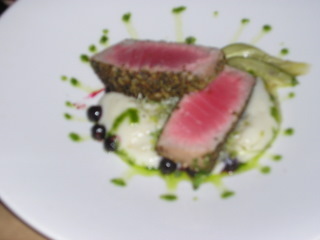 The results are savory blends of spice and herbal flavors and creations that delight the eye. 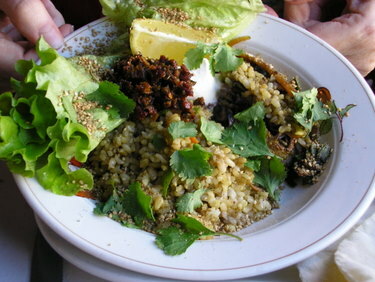 On my first visit, I had a vegetarian dish of brown rice, quinoa, marinated fava beans, fresh chutney, sun dried tomato and mixed greens. 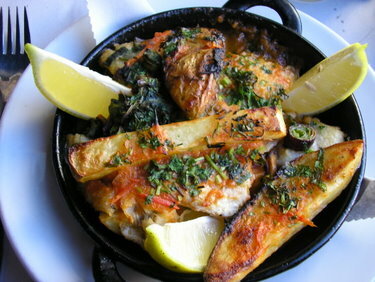 My second lunch was a baked fish casserole with onions, spinach, tomatoes and roast potatoes. All were accompanied by a basket of whole grain breads, which are available retail. Several chicken dishes with curry and other spice/herb combinations are on the menu. Neither dish cost more than AR$20 (US$5.50) and a modest wine list had bottles for the same. Masmadre is a neighborhood gem. 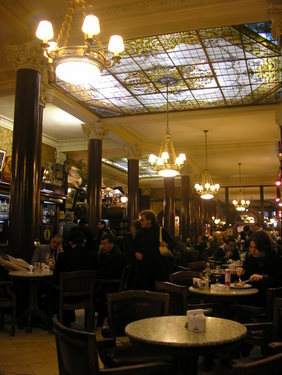 In Buenos Aires, as in Paris, Madrid and Vienna, the café is an essential institution. 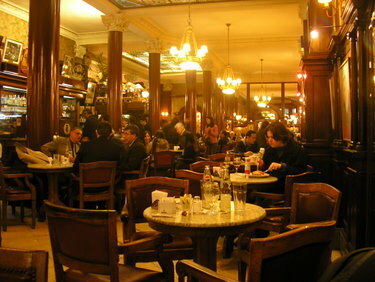 It is not merely a convenient place to get a good coffee and pastry, it’s a civilized intellectual and democratic institution for a gathering of minds to debate national politics, economics, gossip about who’s marrying and/or having affairs with whom - or just to sit and read the newspaper for a few hours. 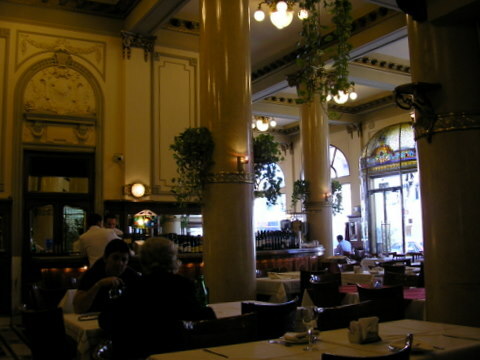 Café Tortoni has been fulfilling this need since 1858 just blocks from the center of national power at Casa Rosado and the Congresso. 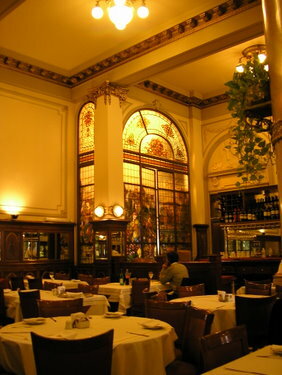 Housed in a magnificent structure with exquisite stained glass windows and ceiling domes, original art works and photos of power brokers, Café Tortoni caters with equal elegance and decorum to the tourist and Portano aristocracy alike. Coffee and pastry cost a bit more, but the china and silver plate will not be available in other cafes - and the quality is superb. The hot chocolate is unlike anything North Americans have ever experienced unless the traveler has been to Paris or Vienna. It’s thick with real cream and rich with deep dark chocolate bars. Sandwiches and light fare are always available at café’s. I had one of my favorite variations on the ubiquitous ham and cheese sandwich - an open faced grilled ham sandwich smothered in a creamy blue cheese sauce. At night, Café Tortoni has a small old tango theater downstairs on an intimate scale minus the Las Vegas glitz. Geared to tourists, the shows start about 8:00 pm - check with the café for the most recent schedule. Coffee service or sandwiches average about AR$15 - 20 (US$4.00 - 5.50) but the priceless atmosphere is free. 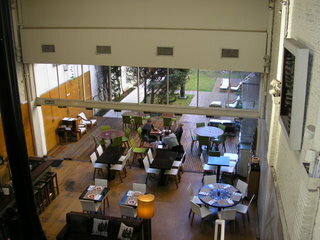 Throughout Buenos Aires there are hundreds of cafes that serve good food at very reasonable prices. Café Pinot is just such a restaurant. I dropped in for my first of three meals simply because it was so close to Mansilla 3935 B & B, and its displayed menu looked fine. I was not disappointed. An array of fresh salads compliment fine burgers, sandwiches and pastas. A modest wine list is available. 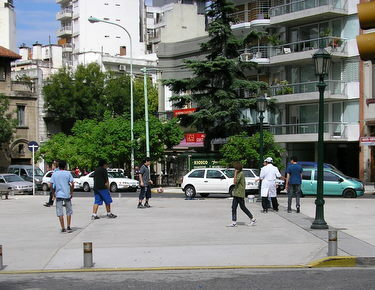 In summer, the tent is removed from the outdoor seating, giving dinners a pleasant view of Plaza Guemas and the children from the local Catholic school playing soccer. Café Pinot is open for Breakfast, lunch and dinner. You’ll be hard pressed to spend more than AR$20 - $40 for any meal with beverage, beer or wine (US$5.50 - 11.00) per person. Paneled in dark wood with the stuffed heads of many game animals lining the walls, Munich Recoleta is a little bit of Germany within an easy walk of the famous Recoleta Cemetery. 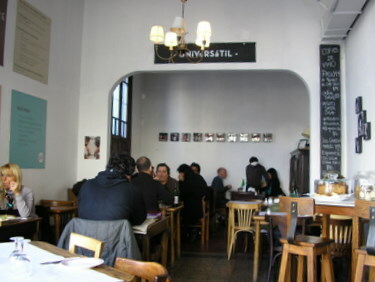 Serving both traditional German and Argentine meat dishes, it has been a sturdy fixture in this wealthy barrio for over 50 years and is popular with business people as well as tourists. The staff looks as if most of them have worked there its entire existence. The menu has a large selection of innards and my grilled kidney was superb - crisp on the outside with an earthy wood infused creamy center. There is a decent wine list and a sizable selection of beers. 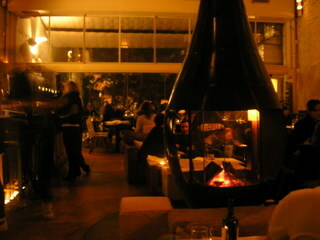 If you want good traditional food in a decidedly non-Argentine atmosphere, you’ll enjoy Munich Recoleta. 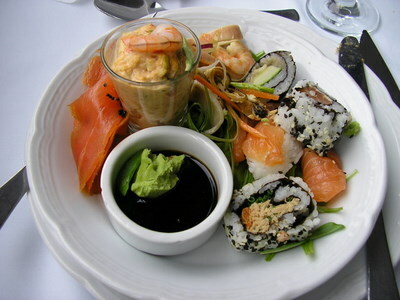 Lunch or dinner for two averages AR$118 (US$31.50). 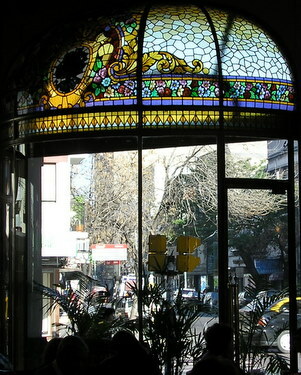 Founded in the late 1880’s and famous in the early 20th century as a fashionable tango venue, Las Violetas has an impressive wood carved, marble and stained glass interior that is worth seeing as an example of the elegance of Belle Époque cafe architecture. I can recommend Las Violetas only for the coffee and architecture. The massive glass cases brim with cakes, pastries and tea sandwiches as elaborate as the gilded interior. If you wish to have an “old world” experience, go for the coffee or tea service complete with white jacketed waiters and sit in a sunny window admiring the elegance of the interior. But do not bother ordering any other food. On the two occasions I ate there both were disappointing. The pastas were overcooked and sauces under seasoned, the fish smelled old and was tough. This section of Avenida Rivadavia, Barrio Almagro, has seen better days. Walking there is usually safe as long as you take normal precautions, but it’s one of only a few areas in Buenos Aires that I take a taxi rather than walk.